2. What Are Mechanism Experiments? 3. Why Do Mechanism Experiments? 4. When to Do Mechanism Experiments Versus Policy Evaluations? 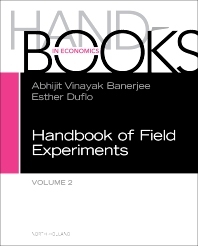 Handbook of Field Experiments, Volume Two explains how to conduct experimental research, presents a catalog of research to date, and describes which areas remain to be explored. The new volume includes sections on field experiments in education in developing countries, how to design social protection programs, a section on how to combat poverty, and updates on data relating to the impact and determinants of health levels in low-income countries. Separating itself from circumscribed debates of specialists, this volume surpasses the many journal articles and narrowly-defined books written by practitioners. This ongoing series will be of particular interest to scholars working with experimental methods. Users will find results from politics, education, and more. Esther Duflo is the Abdul Latif Jameel Professor of Poverty Alleviation and Development Economics, and a founder and Director of the Abudl Latif Jameel Poverty Action Lab. She is a recipient of the John Bates Clark Medal and a MacArthur Fellowship. Ford Foundation Professor of Economics, MIT.